Writing “about” pages is always a little awkward. How do I define myself? I’m 32 years old and have been married for 13 years to an amazing man with whom I share seven children – four daughters, ages 6, 9, 12, and 15 and three sons, ages 13, 14, and 15. I’m a personal trainer, certified through the International Sports Sciences Association and I operate a virtual community and a local boot camp class under my business, Fitness Rebooted. My husband is an offshore oilfield worker, so I play single parent for 32 weeks out of the year while he lives on a five-story platform floating 10,000 feet above the ocean floor, drilling for oil. I was diagnosed with Fibromyalgia in 1992 so you’ll find a moderate amount of mentions about that. I suffered from a plethora of symptoms for over 20 years until I decided to take matters into my own hands. I joined a local boot camp in May 2012 to improve my overall health, modified my diet and have since found that the condition that once consumed my whole life is barely a thought anymore! I blog quite regularly about health and fitness and am addicted to running in road and obstacle races in and around metro Atlanta. Singing is one of my many passions — you’ll often find me uploading song covers to my YouTube channel! I also occasionally vlog there about my random thoughts, experiences and of course, my family. Despite dropping out of high school after the birth of our oldest daughter when I was 17, I went on to earn a college degree in Accounting, graduating with Honors. After nearly four years of doing corporate taxes, I pulled the plug and decided to stay at home with my children so I could be more involved in their lives. 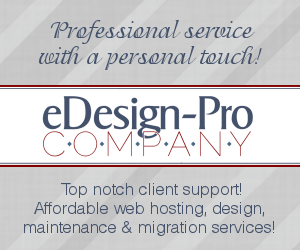 I now own and operate a successful web development/graphic design and hosting business, eDesign-Pro Company through which I also provide consulting and tech support services. Thank you so much for stopping by to check out my blog. I hope you enjoy your stay, and please be sure to come again… while you’re here drop me a comment or two and feel free to subscribe to my mailings and ‘like’ my Facebook page (and if you have a free minute, connect with me around the web also)!